Last fall, at the Canadian bike industry trade show, ExpoCycle, we ran across a new Canadian bike - the EcoCycle. 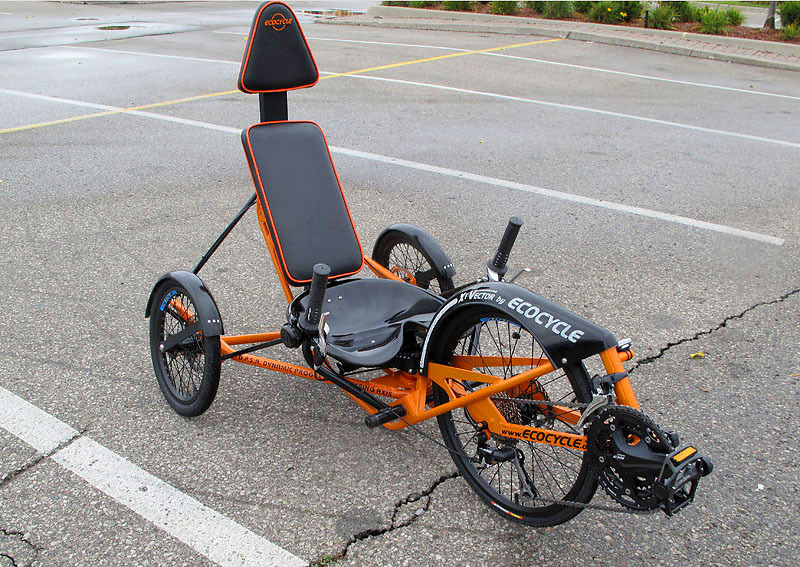 It was a three-wheeled recumbent with one wheel at the front, and an interesting steering system that allows the front wheel to be leaned into turns. I took it for a short spin around the show floor, thought it was interesting and moved on to my next appointment. Fast forward a few months later and EcoCycle inventor Arne Pelkonen called me up and asked if I would like to borrow an EcoCycle for a while to test it out. I met Arne and picked up one of his six prototypes to play around with for a few weeks. 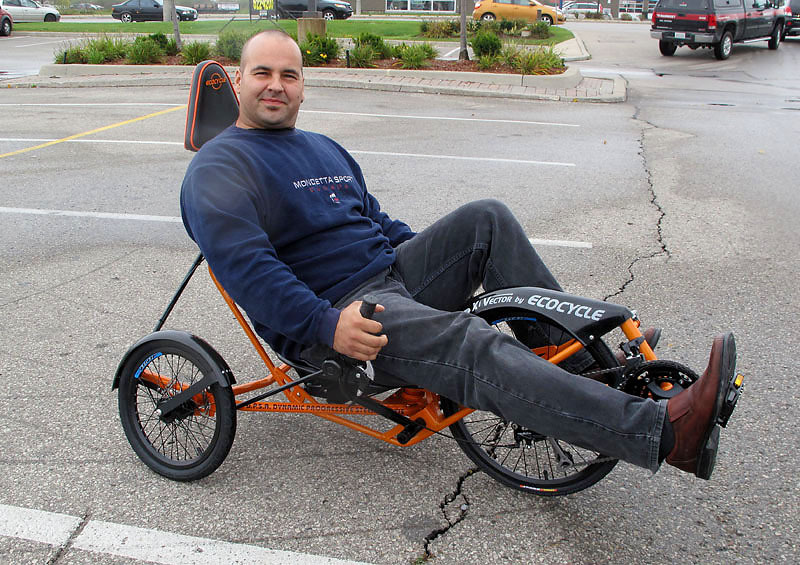 Recumbents come in a variety of shapes and sizes, with two, three or even four wheels. All have the rider sitting down low to the ground, and most have the pedals and drivetrain in front of the rider. Steering is as individual as the design. They are not legal for UCI-type races, except in para-cycling. There is also a concern about visibility, which is why pretty much all recumbents accommodate a flag (as does the EcoCycle). 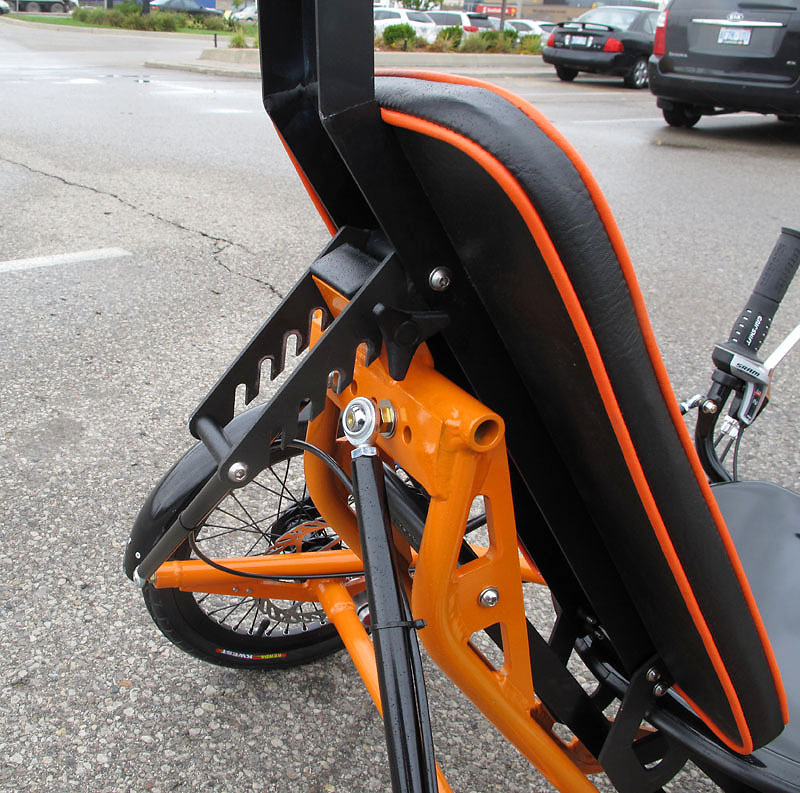 The pros of a recumbent are they are more suitable for people with back problems (you don't lean over like a regular bike), plus the three-wheeled ones work for individuals with balance problems. They can be much more aerodynamic than a regular bike (hence the non-UCI legality issue), and (with fairings) are the choice for Human Powered Vehicle competitions. The cons are weight, the fact that many are unwieldy to store or transport and, because the market is so small, most are handmade and therefore quite expensive. Arne Pelkonen says that the idea for the EcoCycle has been with him pretty much his whole life - since he saw the Mattel Big Wheel kids trike as a child. While tinkering with designs for much of his life, Pelkonen picked up a college diploma in mechanical engineering, and continued to refine his concept, building his first prototype of the EcoCycle in 2007. He has continued to refine his design through 13 iterations, and now has it in the current form: the EcoCycle X1-Vector. The Big Wheel reference is a very good one (if you are above a certain age), since that is exactly what it looks like. You sit low to the ground, between the two rear wheels, with your legs stretched out in front around the front wheel. It is a bit awkward to get into at first, but once you are seated it is quite comfortable. The seating is adjustable - both for length (up to about 195 cm - 6'5") and for angle. Steering is accomplished by using a pair of joysticks - to steer right push the right side forward and simultaneously pull back on the left, for example. The joysticks also include brake levers and Gripshift throttle-style shifters. It only takes a few minutes to get used to how the EcoCycle rides, and the low, wide stance makes it extremely stable - power slides are very possible! Steering and braking are very good - shifting is a little more difficult, since you are also steering with the same grip. Figure-8s in the road are simple, and I quickly got used to carving out high speed turns. Arne Pelkonen had warned me that at high speeds a shimmy can develop - sort of like what happens on a shopping cart - and I did find that once I got it up to 40 kilometres an hour there was definitely a front end shake. For regular high speed riding this can be dealt with stiffer elastomers says Pelkonen, but that does stiffen up the steering at lower speeds. However, while the EcoCycle is a blast at higher speeds - a sustained downhill run would likely be eye-wateringly fast - I think it is most suited for touring or fitness cyclist, especially someone new (or returning to) the sport, who doesn't have a lot of preconceptions about what a bike is supposed to be. For someone with back or balance problems, the EcoCycle would allow them to ride comfortably and for extended periods. I could also see a basket or trailer being easily attached to make it usefull for shopping or commuting. At this point, Pelkonen has made six prototypes, which have been extensively tested under a wide variety of conditions. Using current (very labour-intensive) manufacturing techniques he estimates the cost to produce the EcoCycle at roughly $4000, which is too expensive for the general market. This could easily be cut significantly if it was built in Asia, using assembly line processes (see our Taiwanese factory tour, for some examples). Pelkonen is exploring a number of options to move into production, including having gone through an initial interview for the CBC television program Dragon's Den - he could not state whether he has made it past the first round of assessment. Hopefully, he will be successful in bringing this very Canadian bike to market. If you are interested in purchasing one of the prototypes, or getting further information about the EcoCycle, you can contact Arne Pelkonen through his website: www.ecocycle.ca/.